Google Chrome has been long expected to overtake Microsoft’s Internet Explorer (IE) to nab its position as the Web’s most used browser and, according to data from Statcounter, the momentous change of leadership happened last week. The firm’s latest figures — spotted by Global Nerdy blogger Joey deVilla — show that Chrome’s line of usage creeped to overtake IE’s for the first week ever, with Firefox, Safari and Opera completing the top five respectively. Statcounter’s findings give Google a double win, after the analytics site found that its mobile browser — Android Robot — had leapfrogged Opera to become the most popular option for mobile-based Web surfers in March. 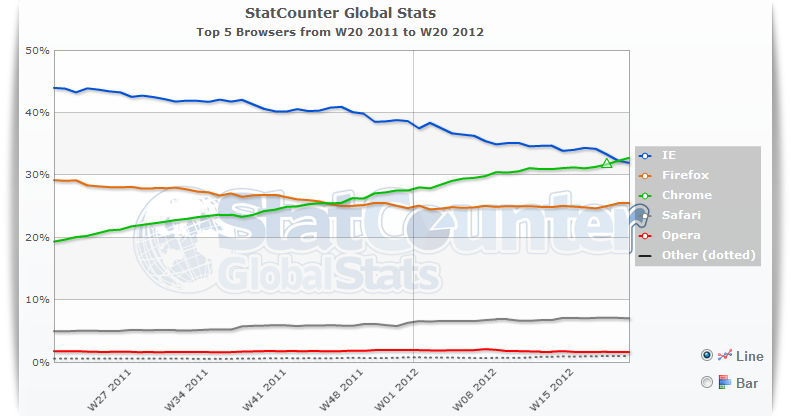 Measuring the Web is an imprecise science, very often based on scaling up small scale measurement surveys, but the gist of Statcounter’s data over the last year indicates that the use of Chrome is rising at the expense of IE and Firefox, regardless of the exact precision of the data. Statcounter first found Chrome to be ahead for just one day, back on March 18, and its breakdown of browser usage over May to date puts Chrome and IE almost neck-and-neck at around 33 percent for the month. However, given that last week saw Chrome push ahead, May could become the first month during which the Google-owned browser has been more popular. 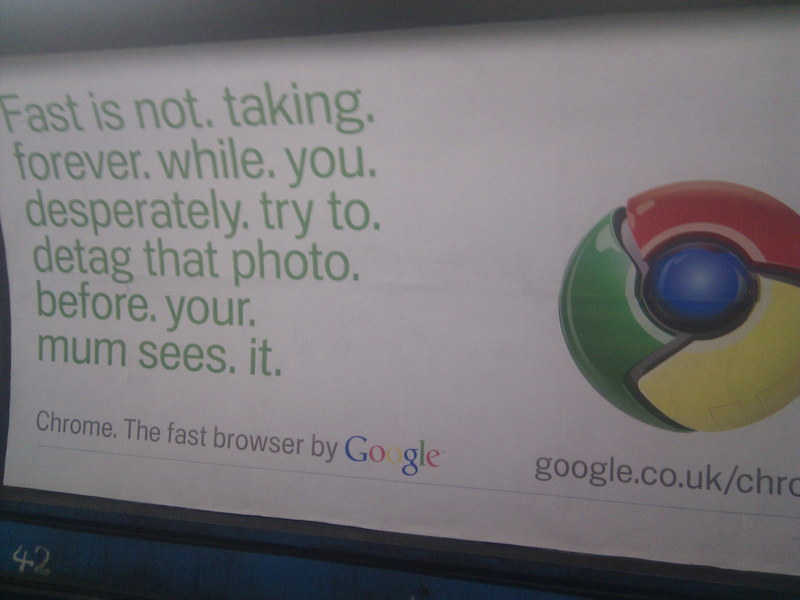 Google Chrome has come on leaps and bounds since launching in 2008. Extensions are a key part of the browser’s appeal, with the latest additions including a scheduler for Google+, a Pinterest like script and these further 9 recommended extensions. 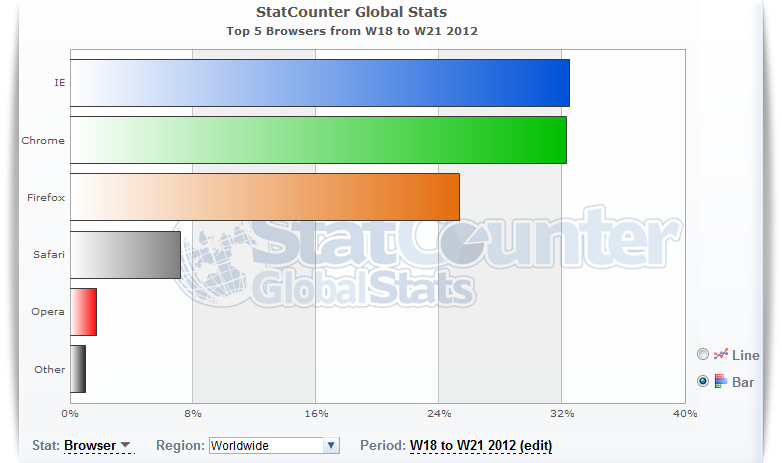 Google is big on internationalising its service and Chrome is no different. For example, its My Chrome Theme social tool just became available in 36 more languages, to help increase its appeal across the planet. Microsoft isn’t taking the challenge lying down and Statcounter recently suggested that the latest version of IE (9) is making progress, and is seeing particularly marked usage over the weekends. Regardless of whether Chrome can maintain its momentum over the rest of May to top the month’s use, Chrome is on the up and we’d expect it to reign supreme in the Web browser world sooner rather than later. Update: Joey deVilla’s latest post shows that data from W3Counter and Clicky throw up different results to Statcounter. Statcounter is widely used as a standard for measuring browser usage — by those in the industry, no less — and, as I pointed out, it may not be 100 percent accurate but its findings reflect the overall trend that Chrome is on its way to the top, if it isn’t already.